Some Mac users have had an issue where the exam software begins to run slower and slower through out their exam. Typically, the user notices this as typing lag where letters typed do not appear for a short time. This happens as a result of the document statistics running too frequently. The solution is to make sure that the document statistics check box is unchecked. The document statistics check box is located to the right side of the exam interface. Click HERE to view a map of what libraries have laptops for check out if you need to borrow one. MAKE SURE AND EMAIL A COPY OF YOUR EXAM TO YOURSELF AFTERWARDS AS THESE COMPUTERS ARE WIPED WHEN YOU TURN THEM BACK IN!! The exam software will allow Open Mode exams. The choice as to whether to use Open Mode is up to your professor. The professors will clearly state to you whether you should use Open Mode when taking your exam. (Even though the exam may be Open Book, the professor may choose to not allow Open Mode in the exam software.) If you have questions about open mode vs. closed mode and what you should use, please check with your professor. Become familiarized with Exam4 interface. Steps 3 below covers information on how to get the most out of the Exam4 software and step 4 covers exiting the exam software and the most important step -- SUBMITTING it! Although there are few exam software issues, testing your computer by doing a practice exam allows any problems to be identified, diagnosed and fixed -- don't run the risk of writing your exam in a bluebook! Read the following instructions A.-E. before following the download link. After clicking the download link, type wisconsin in the search box in the left column. Fill out the download form, select the operating system that you are using, and click "Submit Form"
Click the "click here to download" link. Choose to SAVE the file and if given a choice save to the Desktop. Once the download is complete, both Windows or Mac users can simply double click the downloaded file and the application should be automatically extracted to their desktop. Run the software usually located on the desktop following the download instructions (above). Practice Exams should be run in CLOSED mode. For in class exams, you will be informed what mode to use. We recommend that you choose "largest" option as the font size. It doesn't affect the final print size, however text is much easier to work with on the screen. Do not worry about having to set double spacing or font size, all exams will be printed with the same font size, font spacing, and double spaced. This option is no longer available due to the issues it causes during exams. Mac and Windows: Click on Tools → Insert Answer Separator (You may add the question number to the answer separator.) This causes a new answer header to be printed when the exam prints as forces a PAGE BREAK. NOTE: You must use Answer Separators if you wish to have word counts for individual questions. Do not worry about having to set double spacing or font size, all exams will be printed with the same font size and font spacing. Mac and Windows: Click on End Exam → End Exam Now. 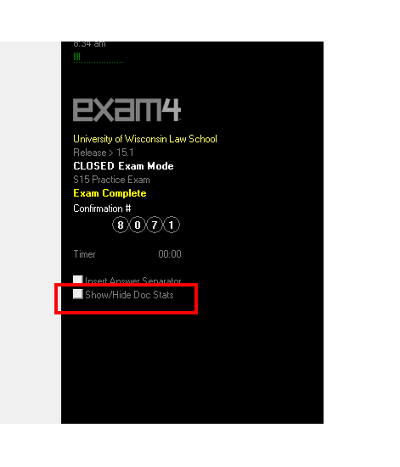 Confirm that you wish to end your exam, and follow the on screen prompts to exit the exam software. NOTE: Make sure you receive the electronic receipt before leaving your exam session. This exam software does not email confirmations; the receipt is your confirmation. Most errors uploading are due to the network not being accessible. Your exam is safe, but a couple more steps are necessary to upload. Exit out of the same software (don't worry you exam is safely saved to your computer). If still not working, turn your airport off and then back on and try again. If still not working, try going to the Apple Menu (top right), to Location and select from the side menu "Automatic". Once network is working follow the steps below under "Submitting a previously completed (or submit error) exam"
On the first window choose "Select An Existing Exam"
Q. Do I have to run in CLOSED Mode? What if I'm allowed to bring notes to the exam? A. The exam software will allow Open Mode exams. The choice as to whether to use Open Mode is up to your professor. The professors will clearly state to you whether you should use Open Mode when taking your exam. (Even though the exam may be Open Book, the professor may choose to not allow Open Mode in the exam software.) If you have questions about open mode vs. closed mode and what you should use, please check with your professor. Q. Can I use Exam4's tech support? A. Yes, most definitely! They provide very good support, and also provide useful FAQs. See Exam4 FAQ. System requirements, program description, and other pertinent information can be found there. Please note that Exam4/Extegrity does provide technical support via email; here is a link to their technical support form Exam4/Extegrity Technical Support. A. Aside from Linux, and perhaps the newest Windows/Mac OS released yesterday, your computer is very likely to be supported. See Exam4 FAQ for a complete support list. Q. Is the exam stored on the network while I'm typing? What happens if I don't have network access? A. Your exam is only stored on the laptop's hard drive until it is submitted. If you forget to sign into the network before starting your test, there will be a couple extra steps at the end, but it is in no way a problem and your exam is safe on your laptop. See Step 4 above for complete details on how to exit out, start up your network (authenticate), and then submit the exam. Q. Is there any documentation handed out at the exam? I've successfully completed a practice exam, but what if I forget a step? Q. Is there anything I can do to make sure that my laptop is more likely to behave itself during the exam? A. Yes, absolutely, keep your computer fully patched and updated! Windows: Open Internet Explorer, click on Tools -> Windows Updates. Mac: Apple Menu -> System Preferences -> Software Update Check Now. Reboot your computer just before the exam! Q. My computer runs ok most of the time. Is that good enough to take a test on? A. It is strongly discouraged to use a machine that locks up frequently or has other problems. See if the laptop can be repaired prior to exams, or try to bring a different one (borrowed, loanded, rented, checkedout, etc). Q. Do I need to do anything right before the exam? A. Yes, authenticate to the wireless and save a couple steps at the end of the exam! Q. If I borrowed a computer, do I need to do anything special? Please email help@law.wisc.edu or stop by Room 2115 if you have further questions or issues.